I would like to introduce you to a 17 years old issue that exists across the whole Arma series, A3 included. It is one of the oldest Real Virtuality engine bug and it has not been addressed since OFP release back in 2001. I wish this post could reach BI devs so one day the problem would finally be solved. Arma3 is ahead of its final roadmap that will lead to its EOL (End-Of-Life). While there were other priorities across the development cycle in recent years, now it seems to be the right time to take care of it. Static objects such as Trees, Fences, Walls etc. which feature DestructTree value (destrType token, config class) or Tree/Fence/Wall value (damage token, model properties) are vulnerable to the bug. If such an object gets destroyed it falls over and losses/ignores all of its geometries (Geometry, FireGeometry and ViewGeometry). A player (or an AI unit) can move and shoot through this fallen object, no matter what material it is. Moreover, an AI unit, as opposed to a player, can also see through the fallen object. As a result, AI is unfairly aided what has a significant influence on the gameplay. Concealment & cover - none of fallen trees, fences or walls can provide it because of the bug. Fallen objects have no collision detection with characters or bullets. Keeping Main Geometry (Geometry) for fallen static objects may negatively influence behaviour of AI (especially AI drivers). Vehicles may not be able to drive through / will collide with the fallen objects. Lack of geometries for fallen static objects is performance-friendly. If Main Geometry of fallen static objects causes improper behaviour of AI or vehicles collide with them, then Main Geometry should be ignored. However, Fire Geometry and View Geometry should be kept to provide basic feature of cover & concealment. Undeniably. However, performance-wise argument could make sense back in OFP times, not in 2018. Unnoticeable performance boost is totally overshadowed by disadvantages the issue introduces into the game (especially for PvE scenarios). I support this 100%. Thanks for the initiative. I'm not sure this is a bug, but intentionally done to "optimize". It would be cool to see certain objects retain their geo though. Thanks Rozek for this post! Time to figure this one out BIS. I think nearly 2 decades and 4 titles is long enough for this bug. Thanks for the effort, Rozek! If they could at least fix the view geometry I'd be a happy person. it was well known in ofp times and referred to as 'the broken bush syndrome'. You 'learned' never to go near broken vegetation while hunting the bad guys. Well... the falling trees are not physically simulated - we tried that at some point early in the development but it was unsustainable on Arma scale. Hi Thank you for the response. If collisions are an issue, would it be possible to at least keep ViewGeometry and FireGeometry for fallen trees/objects? yea this would be great. qualifies as a semi game breaking bug in terms of AI. @oukej i wonder what the issue is in terms of simulation though. honest curiosity. is it the state changing that needs to be kept synced in MP? because trees already have collision just the vector of the model changes one time, right? i don't understand how you need more resources, when a tree is changing its state once other than sharing the state JIP maybe. i understand, if this might be hard to explain or something. i'm just genuinely curious. no one is asking for physX trees falling over afaik, though. maybe a misunderstanding? You are 100% correct. There is no single use of physx word in my original post. As @oukej stated, use of physx for fallen trees is totally out of scope for a game of Arma scale. 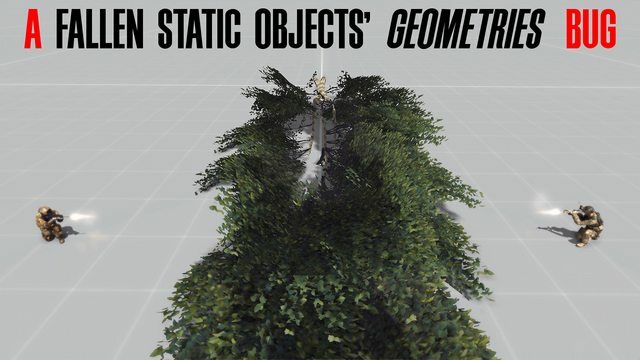 I totally agree with it, but using physx for fallen trees/objects was not what I meant in my original post. The whole idea is to keep ViewGeometry and FireGeometry for fallen objects. Let's keep in mind it is not just about trees. The same issue applies to fences and walls and other static objects that use that kind of destrType. There's been no limit to the animation "force", animations do not ask PhysX scene if they should be stopped by something, but conversely the physics would still be checking if there's a collision with other objects. So if something suddenly appeared in contact or worse inside the tree's geom. the reaction would be violent. The whole idea is to keep ViewGeometry and FireGeometry for fallen objects. Not sure about the FireGeometry - would u block projectiles where a player can walk through? If an AI unit places itself in a ViewGeometry component, it will be absolutely blind (but not deaf). A player can use lack of geometry of fallen tree/object to hide there. If ViewGeometry of fallen trees/objects would work (and there was no FireGeometry), a player would use it against enemy AI units. Players physically don't see ViewGeometry components (it only blocks their ability to radio-spot enemy units) and graphical LODs don't match with Geometries in 100%. In the analogical situation, where an AI unit is hiding in a fallen tree which features working ViewGeometry, it will not engage enemy units because it will not see them (because of aforementioned ViewGeo components). Such approuch would cause a pivotal gamechanger from empowering AI against players to the other way around. Players tend to exploit such issues. That's why keeping both ViewGeo and FireGeo for fallen trees/objects would be required for some kind of Arma's checks and balances system As a side-note, blocking projectiles that were fired from inside of FireGeometry may hurt/injure the firing unit (I am not sure about it though). Does that means we will not see any update to correct AI behaviour bugs (driving being probably a priority) ? 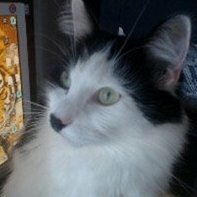 I know I'm off topic but, if possible, it would be nice to clarify what the BI team will do in terms of bug correction for Arma 3. Yeah, perhaps any further discussions, comments and requests towards BI devs Arma3-wise are pointless from now on. But, the forum is still invaluable help for modding community bringing fresh ideas and solutions to issues. I am sure, somebody will find nice workaround sooner or later. People here are tremendously creative and I believe in them. Actually, @oukej gave us honest answer to any further problems (which personally I am thankful for) - to fend for ourseleves and we will comply, I hope. But, selling of the genre with 17-year old bug included (among some others), is the way you want to delight us with your next "project", Bohemia Interactive? Really do you, management of the company, think so? It is a great shame. There is the most important factor in doing your bussiness - your customers, and you don't want to shake them up. I'll start by saying I'm well aware of the bugs arma3 has on many levels. Too many hours sunk into dev branch. I think BIS have supported arma3 as best to their ability. Did they make some mistakes ? Yes. But look at Dev branch. Pages upon pages. 1000s of man hours. They have gone above and beyond in alot of places that other companies wouldn't for their customers. I feel they genuinely were frustrated by their own inability to get the old engine to do things they knew gamers wished for and they themselves as gamers desired for arma3. They have added alot of value to arma3 in their roadmap. Was it perfect no. Again I think they did their best and ploughed through alot of the wishlists of players bi pods, 64bit, advance flight model, that is just scratching the surface so many to mention. I have gotten more than my monies worth from arma3. I for one am under no illusion of the demand for Arma4. If they offered it next year it would sell millions of copies. 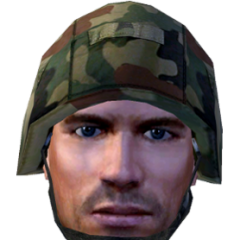 My wish for Arma4 is the Devs now having the engine and ability to bring a true vision and identity to arma, as the go to for military ops and sandbox creation. fun or serious mil SIM air sea and land. To take the crown in its arena and be the first that comes to mind for it. I have built and witnessed people wanting pcs just for arma3. That does not happen often.something for bis to be proud of. Collisions isn't the main problem. The gameplay issue is that fallen trees have NO viewblock for AI so they see and shoot as if nothing is there. This obviously makes it extremely frustrating to fight AI after a few trees have gone down where we cannot see them but they can perfectly attack you.